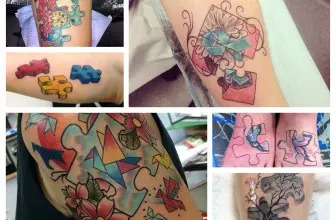 Our selected awesome tattoos will inspire you to get your own tattoo done – find out more about their placement, ideas and designs. The inner wrist is a good place to have your awesome tattoo as it is said to be one of the least painful places for tattooing. It is also an ideal location for smaller sized tattoos and simple words tattoo. What makes the wrist a perfect place for your tattoo is the fact that you can see your tattoo anytime you wish and hide it for work if needed. The upper shoulder is a good place to have a tattoo, especially for men. Due to the way the upper arm is built you use it to showcase your masterpiece tattoos if you have many other tattoos. A tattoo placed on the upper arm can also be used to draw more attention to well-built muscles. The neck is a tricky place to work with for tattoo artists it is still a perfect placement area for your awesome tattoos. Here you can choose to have the tattoo on the front side of the neck or the back of the neck. However, back of the neck seems to work much better for these types of tattoos and also for most others. The back provides enough room to draw big tattoo and so it is a perfect placement are for these tattoos. Besides from being a relatively big space when compared to other parts of the body the somehow flat shape of the back will make it easy for the tattoo artist to draw the tattoo. When lying on the stomach, there are no bodily impediments or barriers that can obstruct the tattoo artist. This is a unique tattoo location that you should try out for your next tattoo. A tattoo behind the ear may look hidden, but this is not necessarily true. With the right ink and choose the right design this tattoo will be easily visible. Another advantage with this placement area is that you can easily conceal your tattoo using a cap or even with your hair. The two are perhaps some of the most painful places to get tattooed but as most artists would tell you the more the pain, the better the image. The calf works well for medium sized tattoos while the foot will be ideal for smaller sized tattoos. 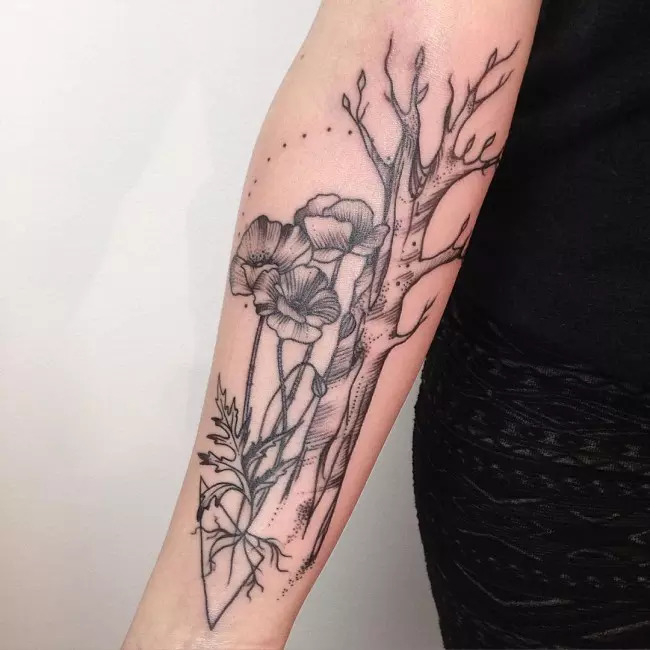 What makes some tattoos remarkable is that they are located in areas that suit their size perfectly and so the two will work perfectly well depending on the size of tattoos you want. Originally men were the only people who were tattooed as most cultures did not allow their women to get any marks on their body. Due to this fact there are more tattoo designs for men than for women. Some of the awesome tattoo designs for men include the tribal designs, bio-mechanical tattoos, and the Polynesian patterns. Besides from this any other masculine tattoo can be awesome if drawn by a skilled artist. With sleeve tattoos you can choose to have a complete sleeve, a half sleeve or even quarter sleeves. However, the tattoo that you chose to have as your sleeve determines how it will look like. 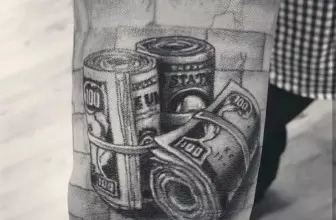 It is important to note that not all beautiful tattoos can look good as sleeve tattoos. 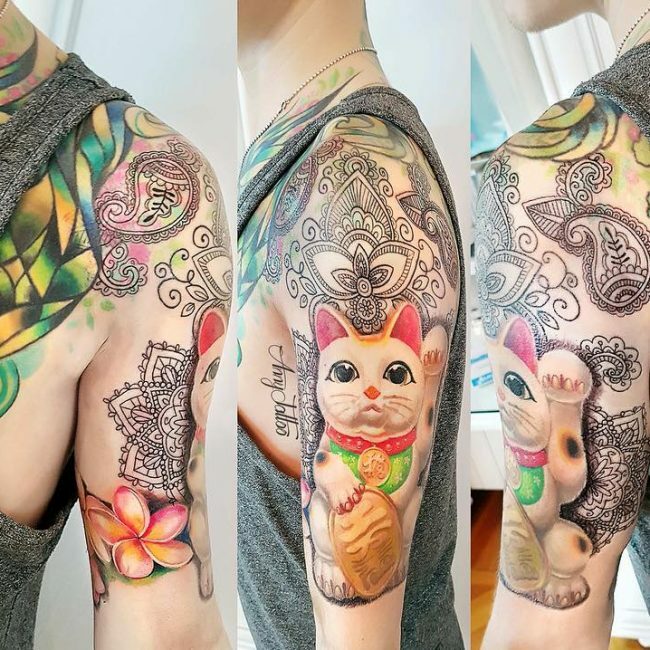 Some examples of awesome sleeve tattoos include the tribal sleeve, colored realistic sleeve and the skull and lily full sleeve tattoo. There is nothing that shows your partner how much they mean to you than a permanent mark on your body. There are different tattoos that couples can get to demonstrate their devotion to one another, but some of the most awesome ones include the Hebrew Fidelity tattoo and the lock and key tattoo. Matching heart couple tattoos are also awesome if drawn skillfully. The arm is a good place to have your tattoo especially the upper arm. Despite being an ideal tattoo location, not all tattoos will look great on your arms and so you have to choose your tattoos carefully. Some awesome arm tattoo ideas include the wings arm tattoo that typically involves drawing one wing on the upper arm. Other fabulous designs include the dream catcher arm tattoo and the floral pattern arm tattoos. Crosses are awesome tattoo designs when drawn on any part of the body. With crosses, the options are unlimited as there are many designs to choose from for example the Tribal cross Aztec cross or the Celtic cross. When you think of tattoos for girls the first thing that comes to one’s mind is colorful flowers. This might be so since girls like flowers and flowers make awesome tattoos, but there are several other fabulous tattoos for girls. Some of these tattoos include angel tattoos and butterfly tattoos. Tribal designs and patterns are some of the most talked about tattoo options. What makes them awesome is the fact that they can be used in almost any type of tattoo and still look magnificent. If you have any tattoo that like but you think it looks a little bit dull just give it a tribal touch. Chest tattoos are mostly associated with masculinity, but there are also many options available for ladies. Beautiful tattoos on the breast or below the breast for ladies are all part of chest tattoo. 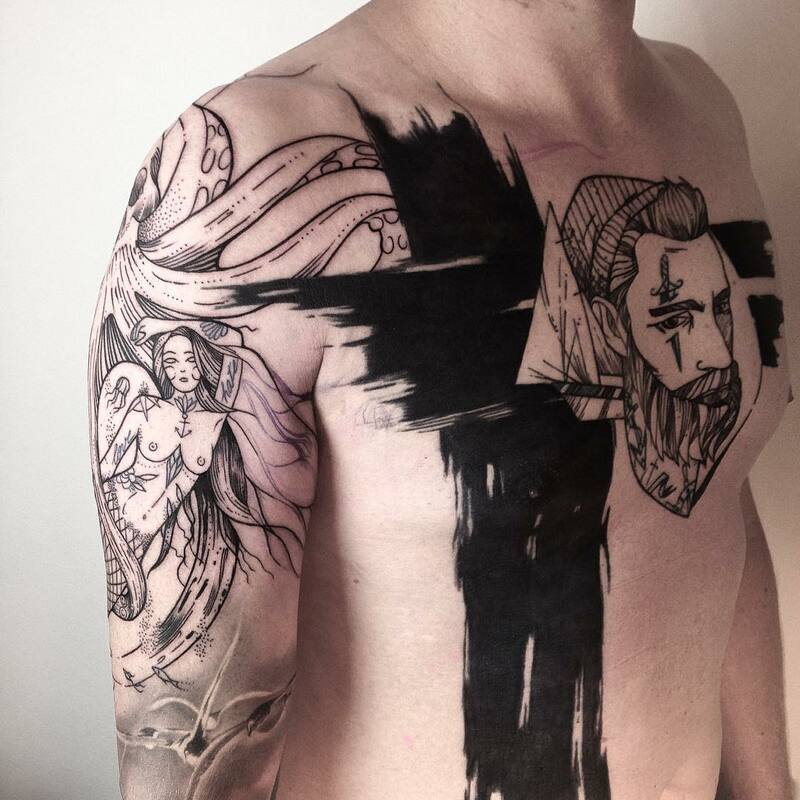 For men, some ideas for fantastic chest tattoos include angel wings and the twin skull tattoos. Shoulders can be tricky to tattoo, and so you should always have yours tattooed by a skilled artist. 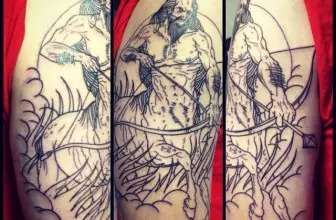 However, if you get an awesome tattoo like the Celtic shoulder tattoo or the Bones and Wings you will be a happy tattoo wearer. The wrist has less fat just like the foot, and so you will experience more pain what getting your tattoo, but the result is worth it. Any small tattoos drawn on the wrist will look awesome provided you choose right colors and font. 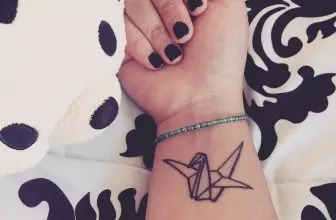 Awesome bow or wrist scripts are some examples of these tattoos. Besides from the symbolic meaning that is associated with this tattoo it also looks awesome. The skull is usually combined with other images to make it look even more fabulous.